Beat the eggs with the help of beater till fluffy. Now, add the sugar and again beat for around 2-3 minutes. Mix half of the maida/flour and baking powder in a bowl and add this slowly to the egg mixture while beating continuously on medium speed. Heat the milk along with butter in a pan, till the butter melts, and add this milk-butter mix to the cake mix and beat again. Add vanilla essence to this mix and also the remaining flour mix slowly while beating continuously. Line the cupcake mould with cupcake paper and fill them with the batter. 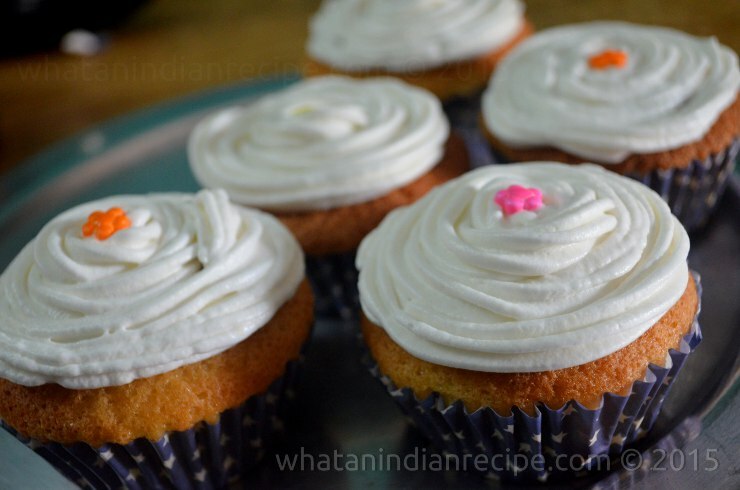 Bake the cupcakes at 180°C for 18 minutes . Once baked till golden brown, decorate it by sprinkling icing sugar or pipe whipping cream and decorate it with sprinklers.